Andy Murray suffered a surprise exit at the Barcelona Open on Friday, losing in straight sets to big-serving Canadian Milos Raonic. The 6ft 5in 21-year-old from Ontario, who crushed sixth seed Nicolas Almagro in the last round, headed into the match having never beaten a top-eight player but rarely looked overawed en route to a 6-4 7-6 (7/3) triumph. He endured a minor blip when serving for the second set, allowing second seed Murray his first break of the match, before breezing through the tie-break to clinch the biggest win of his fledgling career in one hour 44 minutes. Raonic will face third seed David Ferrer or seventh seed Feliciano Lopez in the semi-finals, the Spanish duo meeting in the second quarter-final in Catalonia. Murray had little difficulty in the last round against Santiago Giraldo, but knew he was in for a battle from the outset today. Raonic’s fierce forehands helped him bring up a break point in the opening game. Murray survived, but two aces from the world number 25 swiftly levelled things up. The first set followed a similar pattern – Murray tested on serve and Raonic holding with ease – until game seven, when a loose drop shot from the Scot resulted in a second break point for the youngster, and this time he capitalised to go 4-3 up. Raonic comfortably held again to move within a game of the set and then, after Murray had dug out the hold with the help of an ace, the Canadian brought up three set points with his ninth ace and duly took the first with a forehand winner. Having managed only four points on the Raonic serve in the first set, Murray looked brighter at the start of the second set, but continued to struggle to make inroads against the serve. The Scot served out to love in game three himself, though, and then took Raonic to deuce in game four before the Canadian pulled through with another huge serve. A superb cross-court winner edged Murray ahead again and again he then troubled the Raonic serve, but could not force the break. Just when the second set looked to be following the same format as the first, Raonic too passed up two break-point opportunities in game seven as Murray squeezed 4-3 ahead. But, after powering through another strong service game, Raonic broke Murray to give himself the chance to serve for the match and claim the biggest scalp of his career. Murray showed his battling qualities by breaking back, though, before two clinical service games took the match into a tie-break. However, if the Scot thought nerves were getting to Raonic, he was sadly mistaken. He cruised into a 5-1 lead and, although Murray engineered a chink of light by taking his two points on serve, there was no way back. Berdych ousts Murray and moves on to face Djokovic. Andy Murray saw his Monte Carlo Masters challenge end at the quarter-final stage following a long tussle with sixth seed Tomas Berdych. The Scot took the first set on a tie-break, but was unable to build on his lead as his Czech opponent hit back for a 6-7 (4/7) 6-2 6-3 victory after nearly three hours on court. Berdych will now face either world number one Novak Djokovic or Robin Haase in the semi-finals. Murray and Berdych had met just once before on clay in five previous meetings, with the latter securing a convincing win at the 2010 French Open. There was little to separate the two players early in the opening set in Monte Carlo, but Murray’s second serve then began to let him down and Berdych found himself with the first break points of the match in the eighth game. Murray saved the first with a drop shot, before Berdych wasted the next two with a forehand and a backhand into the net. The Scot then faced five more break points in game 12 as Berdych looked to claim the set, but the Czech failed to take any of them and a tie-break ensued. This time it was Murray who had the mini-break to open up a 6-2 lead. And the third seed gained the advantage on his third set point with Berdych hitting a return long. Berdych came back strongly at the start of the second set, though, and finally claimed his first break of the match in the third game when Murray put a weak forehand into the net. And a further break followed for the Czech four games later, when another poor shot from Murray gifted Berdych a 5-2 lead before he served out his next service game to level the match. Murray was looking slightly deflated now, and it was no surprise when his opponent broke again in the opening game of the third set. The third seed responded by gaining his first break point of the match in the next game and a wide forehand from Berdych levelled things up. But Murray’s serve continued to let him down and his Czech opponent got his nose in front once more in the third game following another error from the Briton. Murray fought hard to get back into the contest, but his confidence appeared to be down and Berdych wrapped up another break, and the match, with a winning forehand down the line. Nole is a three-time Sony Ericsson Open champion! World no.1 captured his 11th ATP World Tour Masters 1000 title and 30th career trophy when he beat no.4 seed Andy Murray 6-1, 7-6(4) in 2 hours and 17 minutes on a hot Sunday afternoon. Nole dominated the first set breaking Murray in the fourth and sixth games for 6-1. The second set went to a tie-breaker, Nole won it 7-4 to become just the third male to lift three trophies in Miami (Andre Agassi, Pete Sampras). 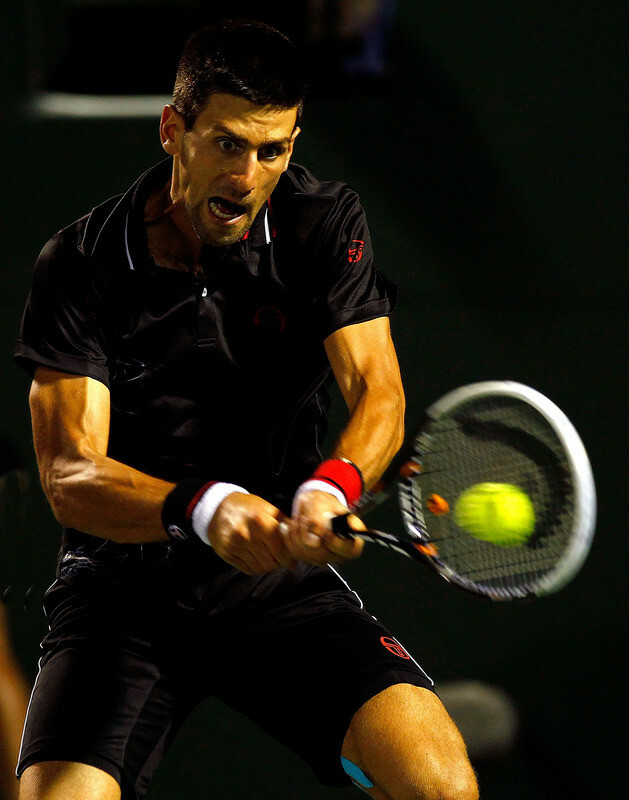 Djokovic has not dropped a set at Crandon Park. En route to the final, he beat Marcos Baghdatis, Viktor Troicki, Richard Gasquet , David Ferrer and Juan Monaco. Novak is now 3-1 in Miami finals. He defeated Canas in 2007 and Nadal in 2011, and lost to Murray in 2009. Match statistics: aces (5-3), double faults (1-3), winners (19-16), unforced errors (38-39), total points won (86-70). “Any title is big, and it means a lot,” said Nole. “I’ve won three times here. I think that says enough about how I feel playing in Miami. I love the crowd… I have been really playing well in the last couple of years here, so this is going to be very encouraging for me prior to the clay-court season.” The 24-year-old Serbian star will open clay season at Monte Carlo Rolex Masters. The first of three ATP World Tour Masters 1000 events played on clay will be held from April 15 to April 22 at the Monte-Carlo Country Club. Rafael Nadal won an Open Era record seventh successive title there last year. 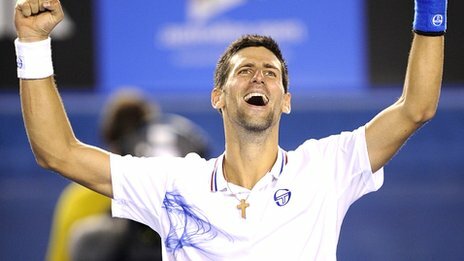 Novak Djokovic claimed a 6-0 7-6 (7/5) win over Argentina’s Juan Monaco to book his place in the Sony Ericsson Open final against Andy Murray. Murray will get the chance to try out some of those tactics as he faces Djokovic for the third time this season in Sunday’s final. Djokovic beat the Scot in five sets in the Australian Open semi-final on his way to claiming the Melbourne crown, but Murray got some revenge at the same stage in Dubai. It’s deja vu for Murray as he loses again at Indian Wells. Andy Murray suffered a surprise early exit from the BNP Paribas Open in Indian Wells on Saturday night at the hands of world number 92 Guillermo Garcia-Lopez. The British number one, who received a bye in the first round of the first Masters 1000 tournament of the year, headed into his second-round clash having not lost a set in his previous two encounters with the Spaniard. But Garcia-Lopez produced one of the best performances of his career to stun the world number four 6-4 6-2 to advance to a third-round meeting with American teenager Ryan Harrison. Murray, who crashed out of the event at the same stage last year to American qualifier Donald Young, had numerous chances to break his opponent in the first set – notably from 0-40 – but could not capitalise. Having kept his nerve to keep the match on serve, the first break finally arrived in game nine and went in Garcia-Lopez’s favour, the Spaniard making the Briton pay for several sloppy forehands. Garcia-Lopez closed out the first set and Murray cut a frustrated figure at the start of the second, particularly after losing his opening service game. Murray must have sensed a turning point when he saved four break points and held serve in game three to get back to 2-1. But, unconcerned by failing to establish a double-break cushion, the 28-year-old from La Roda continued to play positive tennis and make Murray work hard just to stay in contention, his single-handed backhand troubling the Scot throughout. And any hopes Murray harboured of getting back into the match were well and truly extinguished in game seven when a forehand into the net saw Garcia-Lopez break serve again to go 5-2 up. He duly closed out the match against his shellshocked opponent, setting up a third-round meeting with Harrison following the 19-year-old American’s 7-6 (7/5) 6-3 victory over 25th-seeded Serbian Viktor Troicki. Murray was baffled by his performance. Roger Federer continued his impressive run of form with victory over Andy Murray in the final of the Dubai Championships. The 30-year-old, with 16 Grand Slam titles to his name, triumphed 7-5 6-4 in one hour and 30 minutes to claim his fifth Dubai title and 72nd in all. Federer dropped serve for the only time all week as Murray fought back in the second set, but the Swiss held firm. “Winning is the best, it solves everything,” said Federer. After taking his winning streak to 10 matches on the back of titles in Rotterdam and now Dubai, he added: “I’m really happy, it went so well.” Federer had looked impregnable on serve all week, coming through a tight semi-final in two tie-breaks against Juan Martin del Potro on Friday after Murray’s defeat of world number Novak Djokovic had grabbed the headlines. The Briton, who had served impressively himself in defeating Djokovic, fashioned the first opportunity in the final when he earned two break points in game six. However, a loose backhand error followed by a netted forehand under pressure saw the moment pass, and Murray would regret that fleeting opportunity when Federer made the breakthrough at 5-5. The 24-year-old Scot fought back valiantly from 0-40 and saw Federer blaze a forehand wide on his fourth break point, but the Swiss made no mistake when presented with a fifth chance as a heavy backhand proved too much for Murray at the net. Murray looked flat in comparison with Friday’s semi-final and was not helping himself with a first-serve percentage that rarely moved above 50%, allowing Federer to attack his second serve. Dubai semifinals set: Federer v. Del Potro, Djokovic v. Murray. The same old Murray couldn’t get the job done even though Djokovic was only firing on 3 cylinders. Murray becomes the fist man in the Open Era to be eliminated in semi-finals at four successive Grand Slams. But he can take heart from one of the best performances of his career so far, just a few weeks into his partnership with new coach Ivan Lendl.